Ahhhhh! My most favorite place in the entire world to be! Salt air in my hair, sand in my toes and the sound of crashing waves, what more can a girl ask for to be totally relaxed? 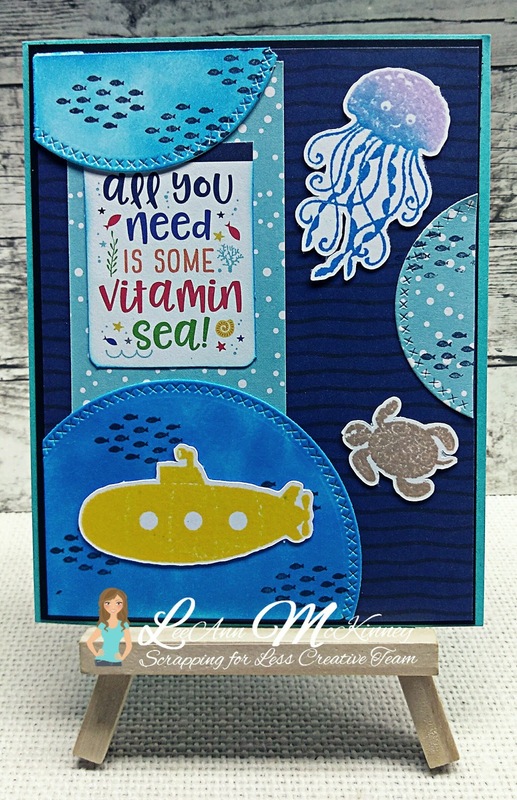 Well, the next best thing to me is to grab some summer-themed products and make beach themed cards! And do we ever have that on the agenda for today! So grab yourselves an island cocktail (not coffee this time) and lay back in your lounge chair and browse through the wonderful creations the design team and guest designers have to offer you today. 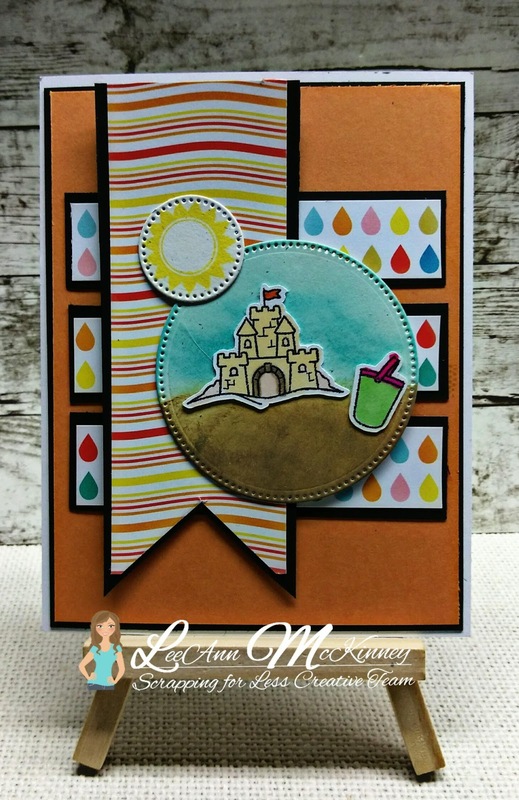 Our fabulous “At the Beach” card kit is available now, but don’t fall asleep in that chair or you just might miss out! Ok, so maybe I have seen the Jaw's movies too many times. Including the original at the theater when it first opened. To this day I do not like swimming in the ocean. I used collection 1 and sketch 1 for this project. My favorite sea creatures, Jellyfish and turtles. And I do love the Yellow Submarine. Collection 2 Sketch 3. A nice umbrella drink under a palm tree is just about right here. It's Happy Hour... Collection 4 and Sketch 2. 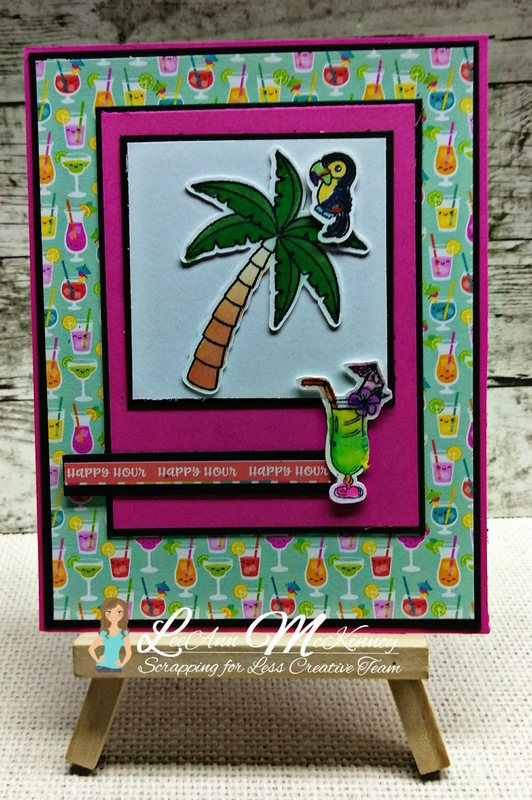 The drink is from the Banana Split Stamp set. I was just looking at photos of my grandbabies at the beach playing in the sand, so this is the project that came to me. And the raindrop background paper, well in Florida it does rain almost every day for at least 5 minutes. Collection 3 and Sketch 4. You should have come to me from Tina's Blog. Up next is Tanya's Blog. Thanks for stopping by today! 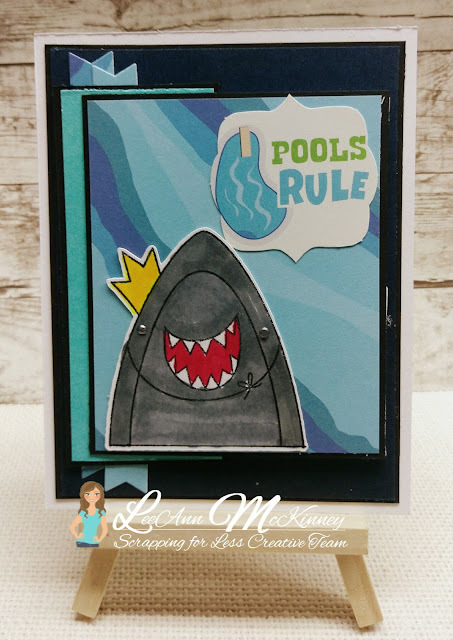 Don’t forget to enter the Rafflecopter on the Scrapping for Less Blog! Awesome cards! So excited for this hop! Cute cards. This is going to be a fun kit! for swimming! lol Your cards are all fabulous, cute designs. I love the multi colored sentiment on card 2. Great cards! Love them all. Great job!!! LeeAnn, I really like you Happy Hour card! It's so fun and festive with all the bright colors! Awesome cards! I love that shark, reminds me of Jaws also. Wow! Awesome set of cards!!! Love the gorgeous colors!! !